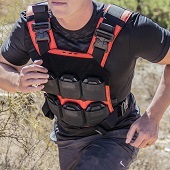 AR500 Armor® ABS was developed to satisfy the growing demand for modular protection of the abdominal area. Flexibility is by far the most important factor with auxiliary body armor; which we achieve with our Abdomen Ballistic System. Our Abdominal Ballistic System Panel offers a unique blend of flexibility, modularity, and protection. The AR500 Armor® ABS Panel is designed to fit our unique pouch design, integrating it into your plate carrier’s cummerbund flap or inner plate pocket. This pouch can be secured via Velcro, or option modular attachment straps. ABS armor provides a natural fit with your existing body armor, resulting in an adjustable extension of your body armor. Level IIIA Hybrid (Soft) 9.5" x 6"